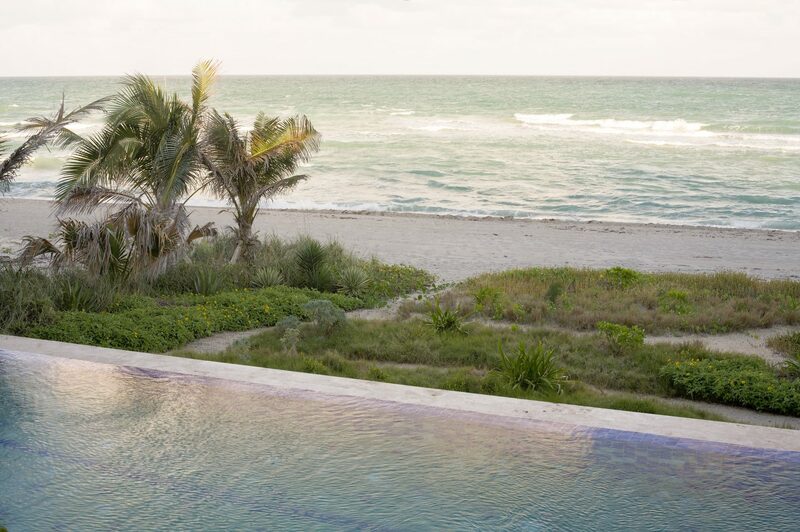 Caminito Del Mar | Raymond Jungles, Inc.
Shimmering sandy beaches stretch for miles along the Atlantic Ocean in South Florida. In this winter playground where hotels and condominiums reach skyward, private beachfront homes are rare. Yet here a homeowner found his personal slice of paradise in a nondescript house in Golden Beach overlooking the sea. Because of building code issues, he opted to renovate the existing house instead of building anew. Working with Peter Corrales, he added considerable square footage. We recommended Rene Gonzalez to finish the interior, and made several changes to the exterior of the residence. The long narrow lot, 62.5 feet wide by 270 feet long, did not have much area for landscaping, which the site desperately needed. 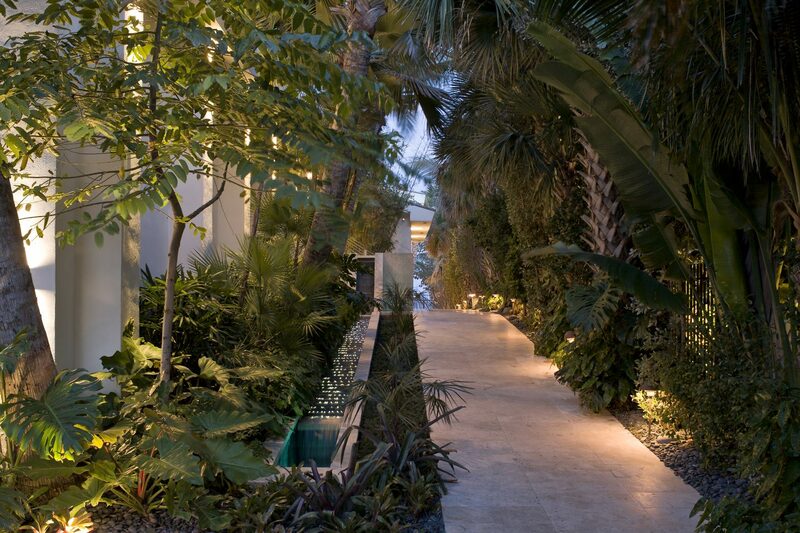 The driveway entrance is flanked on both sides by two six-foot-tall planters where we planted Mexican Breadfruit, a tropical aroid that adds privacy and helps diminish the scale of the three-story residence. We designed a stainless steel gate for security and texture. 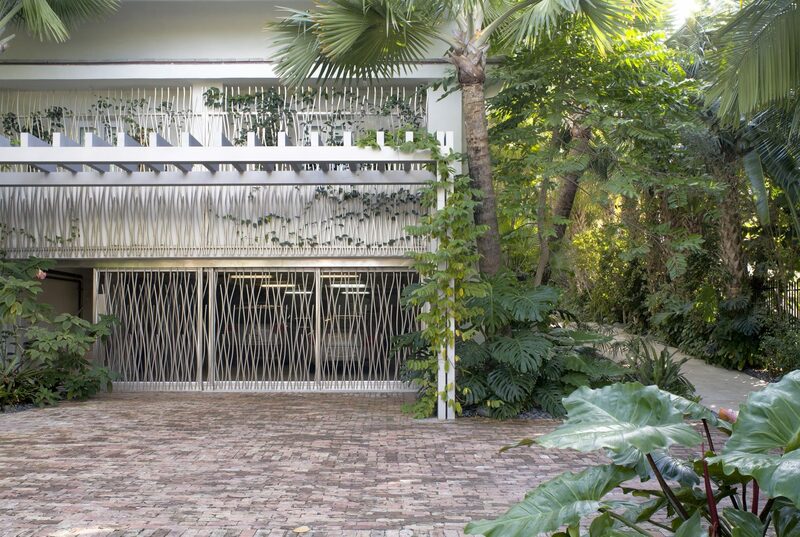 The same stainless steel organic pattern of the gate is repeated on the front of the house, functioning as the door into the ample-size garage and as a vine trellis for the second story. We positioned an oversized stainless steel pergola in front of the garage to further diminish the three story abrupt west elevation. 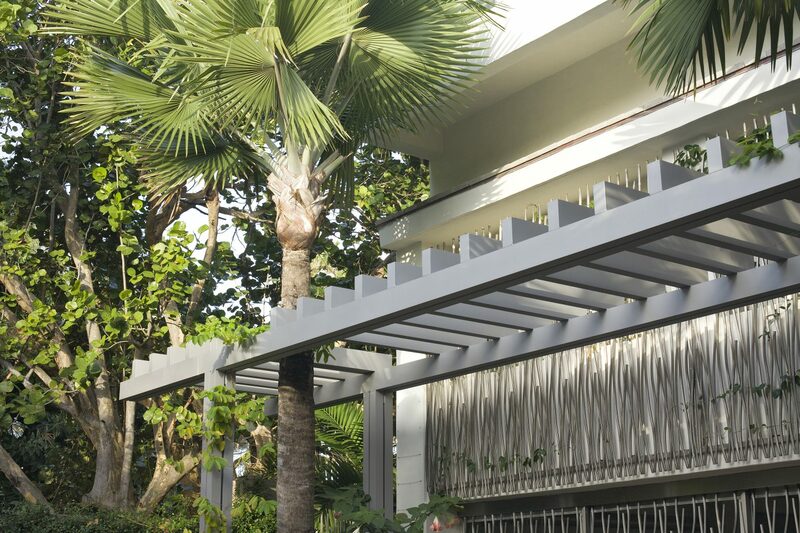 Large scale palms, Bismarckias, and a South American Oil Palm act as a foil to the building scale and shade the parking court. The sculptural Oil Palm also serves as a reminder of the owner’s cultural heritage. The generous motor court easily accommodates four cars and is paved with brick salvaged from the previous driveway. A mature specimen sea grape was protected throughout construction, and bends graciously over a matching pedestrian gate that allows access to and from the street. Our most important contribution was our suggestion to eliminate parking and a proposed covered walkway alongside the South face of the building. Instead, we redirected circulation from the auto court to the front door through a linear garden. The gentle rise reveals the Atlantic Ocean midway up the ramp, a stunning surprise. 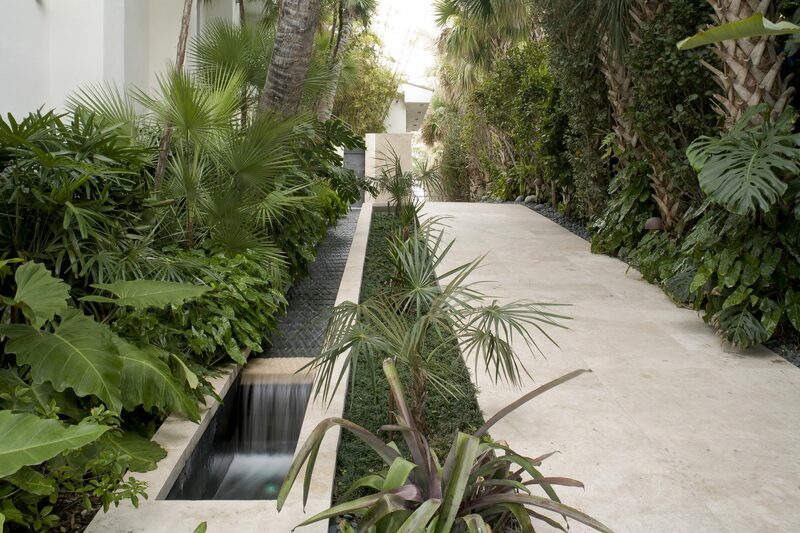 Lush plantings envelop this path leading to the platform-like steps at the front door. The door is flanked by salt tolerant Bambusa Malengensis. 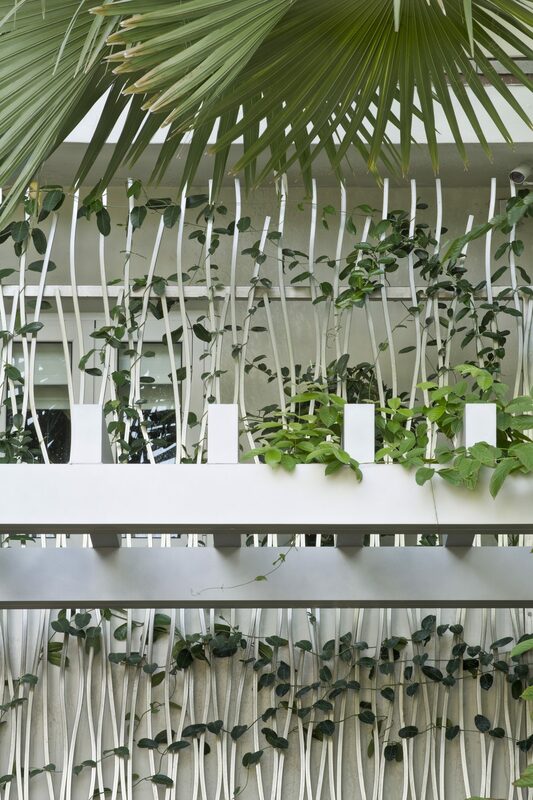 A large window beside the entry brings the garden indoors, with gentle shadows of the bamboo dancing across the room. The window and bamboo are repeated on the opposite side, linking the north and south gardens through the interior space. Parallel to the path, a sleek cascading stream flows from the entrance down to the motor court. Masking sounds of the busy street, the two-tiered water feature comes alive at night when thousands of tiny fiber-optic lights are illuminated. 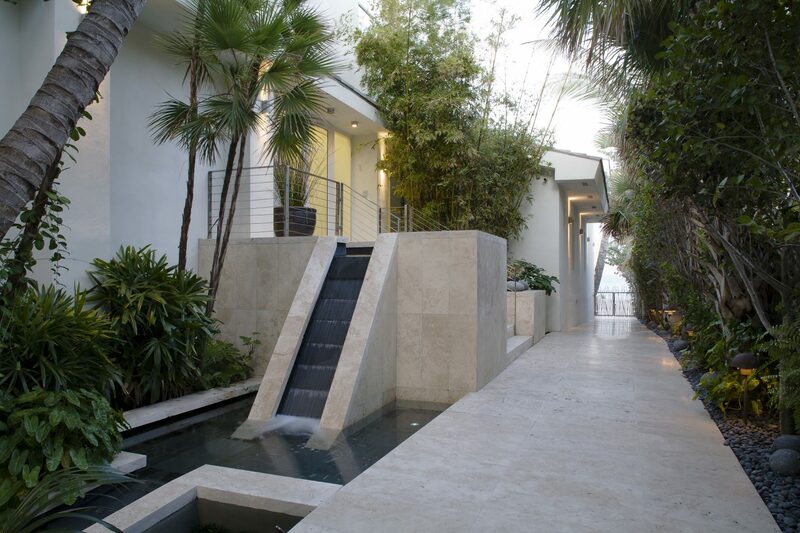 As the stream flows between the house and path, it mimics the slope of the entry walk and animates the space. Along the house, plantings are layered in various volumes and feature a variety of native and exotic species. 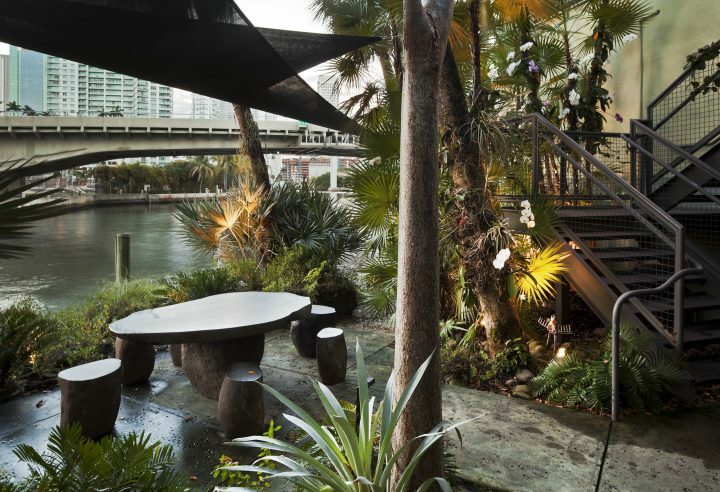 Coconut, Everglades, and Bismarckia palms provide scale, and Monstera, Bromeliads and Dwarf Mondo Grass add texture. 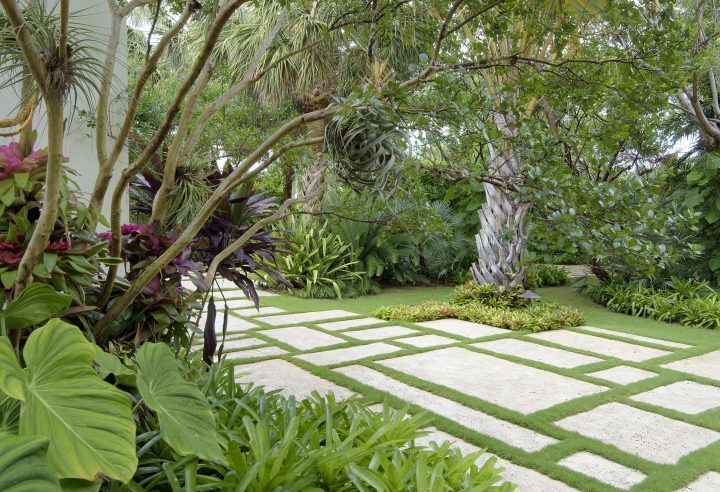 In the restrictive three-foot-wide planting space at the South edge of the property, a dense buffer was installed with mostly salt-tolerant Florida natives including Sabal Palms, Pigeon Plums, Silver Buttonwoods, and Jamaican Caper, their staggered heights screen the neighboring house less than ten feet away. The ground is covered with Mexican beach pebbles. Bromeliads and orchids grow on tree trunks adding color to the dominantly green woodland. Beyond the entry, the path descends to the beach. The same travertine used on the entry walk, fountain, and steps continues onto the pool deck. We maximized the footprint of the pool to underscore the horizon. 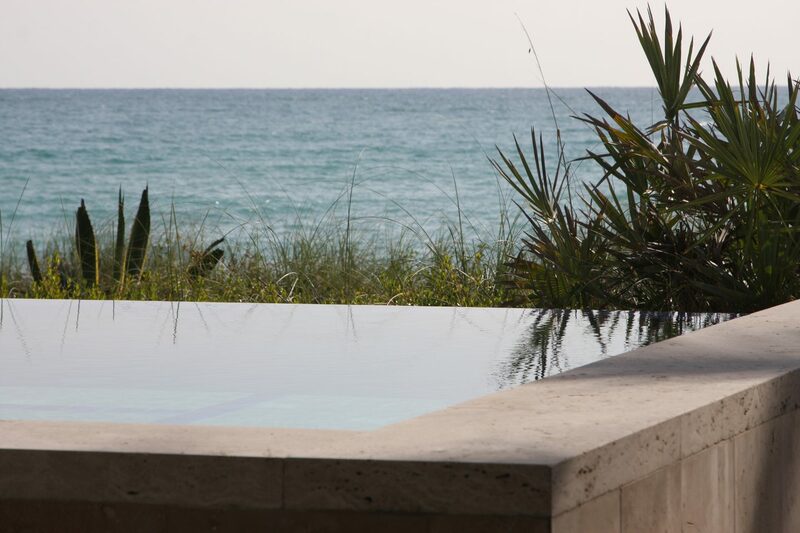 It is perfect for laps or lounging, with a seat ledge running the entire length facing the Atlantic Ocean. The pool interior is finished with contrasting tiles, pre-purchased by the client. We patterned the tiles to gradually change from light to dark, emulating the Atlantic’s transition from shallow to deep. 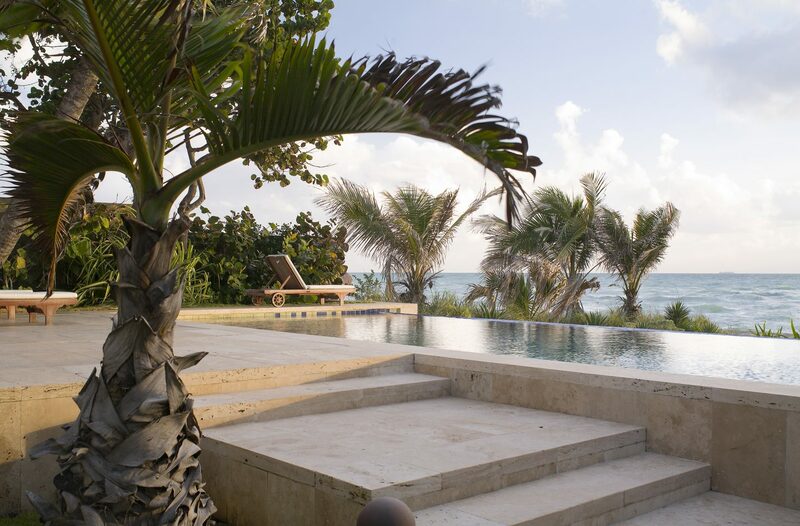 Highly visible from the house, the infinity edge pool is always in view. 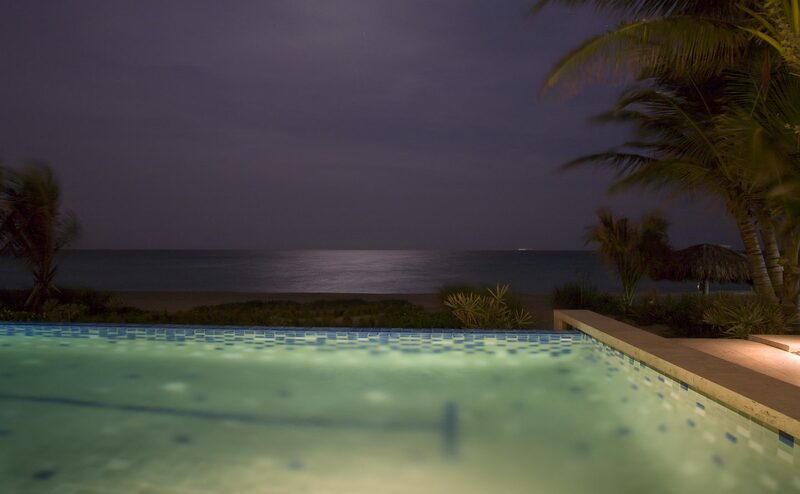 Fiber-optic lighting at night emanates a peaceful glow, out of view of the nesting sea turtles. Coconut and Bottle Palms were added seaside, and we planted the dune with native species including Agaves, Yuccas, Sea Oats and Dune Sunflower for habitat restoration and erosion protection. All were chosen to endure intense winds and salt spray from the nearby ocean. Along the North side of the house, light streams in through floor-to-ceiling windows, our suggestion in lieu of a wall to ease the tension inside where the room seemed too high for its width. By visually adding ten feet of side yard to the space, usually relegated to storage or utilities, we balanced the proportions of the room. Here we designed a travertine bi-level shelf that displays pottery, sculpture, and ornamental plants. These can be changed depending on the mood or season. Behind the shelves thin, multi-trunked, Everglades Palms were installed. Similar in character to Bamboo, these palms have colorful orchids and delicate Tillansia attached to their trunks and allow passage of filtered light. 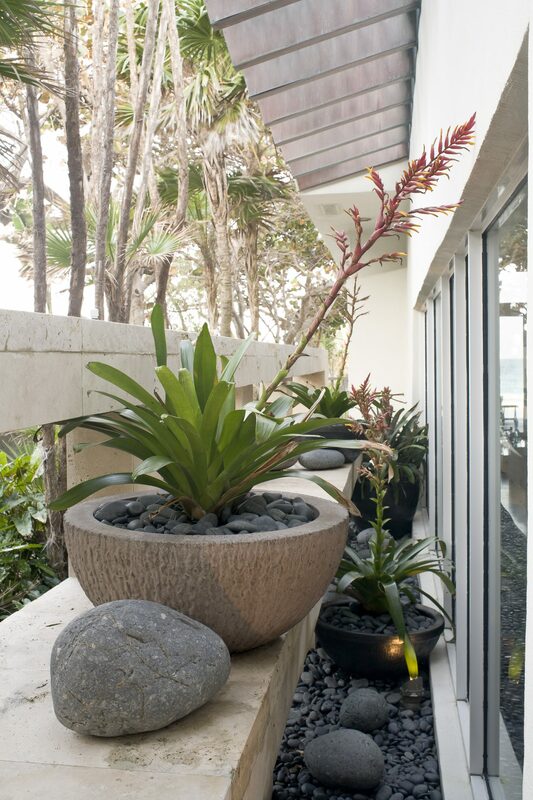 Mexican beach pebbles cover the ground and continue under the glass inside, creating a strong visual connection between the indoor and outdoor space. Often our best solutions result from working with very tight restraints. 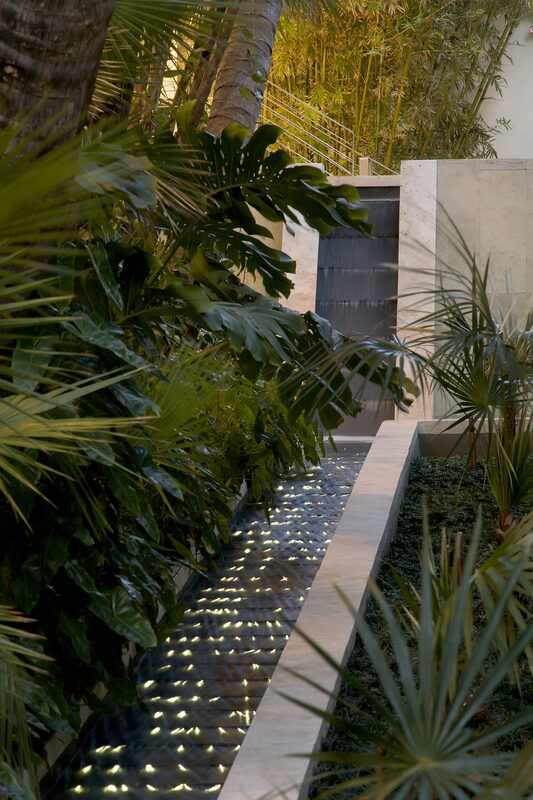 On this limited site we juxtaposed elements of water, sound, light and color while keeping hardscape materials bold and minimal. We endeavored to strike a balance of scale linking the natural and man-made environments.